My love of fiber began years ago when we acquired our first two alpacas, Godiva and Permanent Ink. Since alpacas grow a lot of fiber in one year and can’t tolerate much summer heat, they need to be sheared every Spring. Besides that, the fiber gets matted and unusable if it is not removed. This left us with bags and bags of lovely alpaca wool fiber every year. What the heck was I going to do with all of that fiber?? I asked my fellow alpaca breeders and most of them, surprisingly, did absolutely nothing with their fiber. They tossed the bags of fleeces in the attic because they didn’t know what to do with them. I did not like that idea. I wanted to turn that fiber into something wonderful. So, my research brought me to the world of sheep wool. 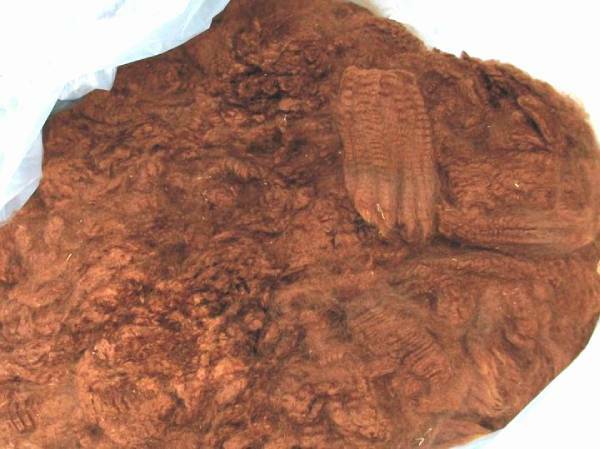 What did the sheep breeders do with their wool fleeces? 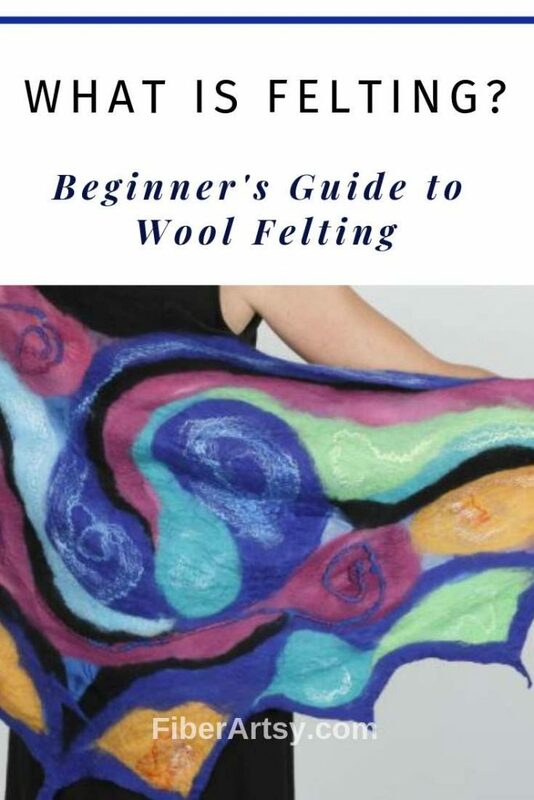 And that is how I was introduced to the Wonderful World of Wool Felting! Felting is the process of producing felt, a textile or fabric that is made by combining and compressing loose fibers or hair. You can use fibers that are synthetic or natural. However, they don’t felt exactly the same way. Do you remember the sheets of brightly colored felt fabric that you used in kindergarten? Those are made with synthetic fibers and mass produced by some large machines. I honestly don’t know much about that process. In this article, I will focus on working with natural fibers. There are two basic ways of felt making: Wet and Dry. Wet Felting is the process of using water, soap and some form of agitation to cause the fibers to open up and then bind together. 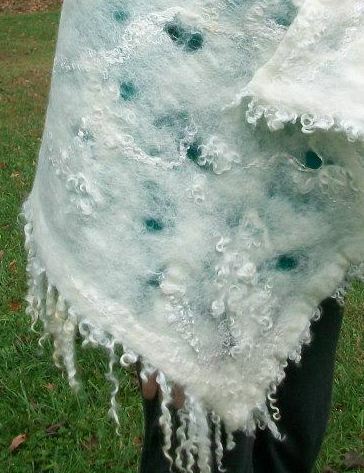 You can do this with raw wool fiber, washed fiber, carded batts, or processed wool roving and sliver. This process also works for felting previously knitted, crocheted or woven items such as wool sweaters. Have you ever accidentally shrunk a wool sweater by sticking it in the washer and dryer? Well, you can actually do that on purpose, too! 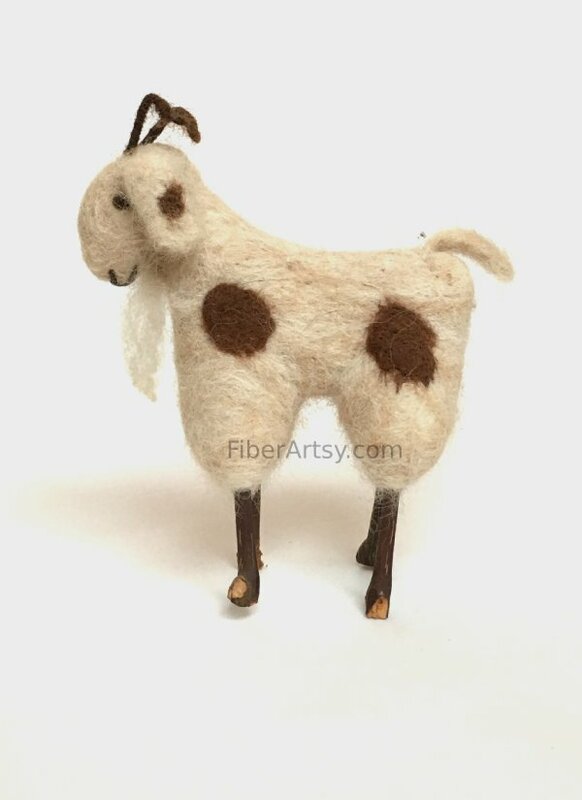 Dry or Needle Felting: This involves using special barbed needles to basically weave the individual fibers together until they form a matted piece of felt. You can do this by hand with a single needle, multiple needles or you can felt on a larger scale with machines. See the little notches on the Felting Needles? 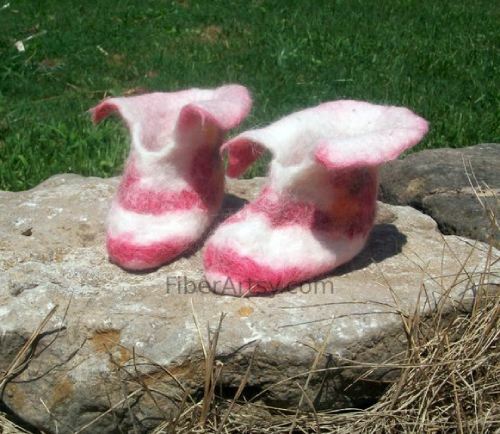 The very basic steps you use for the different wet felting methods are the same. Basically, the wool is arranged in perpendicular layers to make an interlocked piece of felt fabric. Then you apply water and soap and work it into the wool. Next, the piece is manipulated with your hands, gently at first with gradually increasing pressure and agitation. Finally, the piece is rolled up inside a matchstick blind, bubble wrap or a sisal mat. This is rolled back and forth a few hundred times to further felt the wool. Once the wool fibers are sufficiently interlocked so they don’t come apart, the Fulling stage begins. Fulling the felt fabric involves dropping and throwing it on a table. This creates a firm piece of felt which can then be cut and sewn without raveling. Your final felted fabric will be much smaller than the original layout of wool. How much shrinkage occurs depends on the direction of the fibers and the amount of agitation and fulling. Generally, you can count on your final piece being about 25 – 30% smaller by the time you are done felting. The basic method is used for making a flat piece of felt fabric. It’s appropriate for thick, sturdy pieces such as wallhangings, coats, purses and tote bags. The steps for basic felt making are the same as described above. The only variable is how many different layers you use to achieve the desired thickness. See the full step by step tutorial for Making a Piece of Felt Fabric. Nuno Felt Making is a relatively new technique developed by fiber artist, Polly Stirling around 1992. The main difference with Nuno is that an open weave fabric is incorporated into the felt. This can be a super lightweight silk chiffon or a heavier muslin or even burlap depending on how heavy you want your finished piece to be. During the felting process, the wool fibers work their way through the fabric, bonding the two materials. The Fulling process creates a wrinkled effect. Nuno is the perfect technique for making very flowy and lightweight shawls, scarves or even curtains. Cobweb Felting is also a flat technique. The wool is laid out in various thicknesses so that the final felt fabric has a lot of texture with thick and thin areas and even holes. The fiber has to be thoroughly felted and fulled to make sure the piece does not come apart. Cobweb is a good technique for scarves, shawls, wraps and wall hangings. Lattice Wet Felting means just what is says – creating felt fabric in a lattice pattern. A flat method which makes beautiful scarves, shawls and wraps. Felting a piece of fabric and then cutting out the “negative” areas, leaving the lattice work. Laying out the wool in a lattice pattern in the beginning. The first method is a bit easier, especially for beginning felters. The second method is a little more challenging since you have to felt the individual strands. 3 Dimensional means any wool felted piece that is not flat such as a bowl, hat or slippers. Generally, you felt over a mold or support of some kind such as a bowl for hats and vases. I’ve also seen hats felted over balloons. 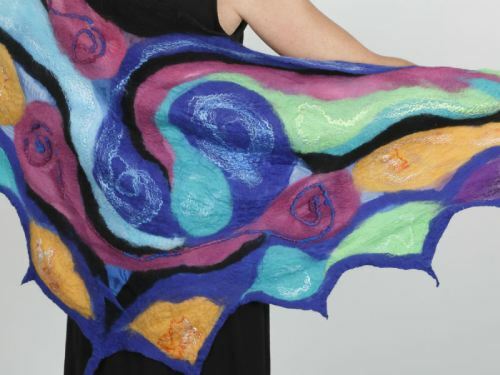 It’s also possible to create 3D Felted pieces using a Resist (next section). Resist Felting uses a barrier of some sort to keep certain areas from bonding together. Many times this is a sheet of plastic. The Resist is placed between layers of wool which are then felted. When the Resist is removed, there will be two separate layers of felt. This method can be used to make 3D felt objects such a bowls or cat caves and it can be used to give flat pieces some dimension and texture. 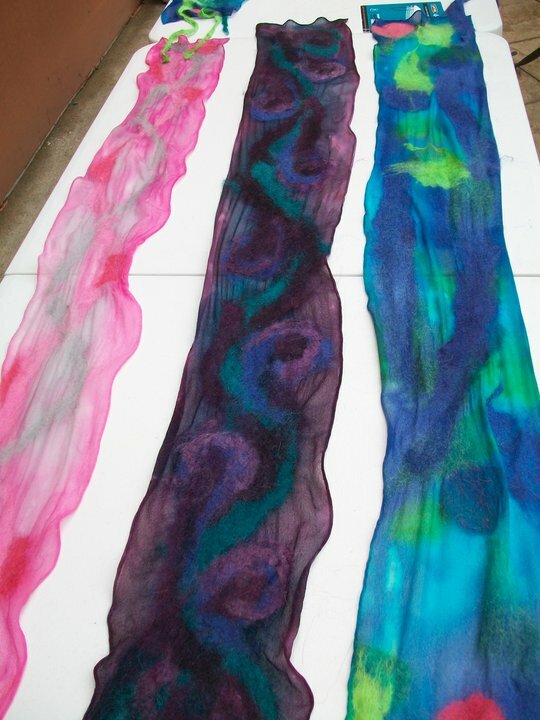 Those are the main Wet Felting Techniques which can also be combined to create various textures and effects. For instance, I often combine the Nuno and Cobweb Techniques in my shawls to give them structure with the fabric but also make the shawls lightweight by thinning out the wool. How to make DIY Felted Dryer Balls – an eco friendly alternative to using dryer sheets or tennis balls to dry your laundry. Felted Soaps – a great project for beginners. Also a fun way to introduce children to wool. Wool fiber or Protein aka animal fiber includes sheep wool, alpaca, mohair (goat), cat fur, dog, human hair … all of those are protein fibers. This can be in any form such as raw wool, washed raw wool, roving or carded fiber and locks as well as yarn. Knit Picks has a nice selection of Wool Roving in white or multi colors. Knit Picks also carries a line of Feltable Yarns. Here is a Premium Kit which includes everything you need to get started. Can I use Synthetic Wool? If you look at a single hair from a sheep under a microscope, you’ll notice that it is not smooth. There are scales along the shaft of the hair. Hot water causes those scales to open up. When you apply hot water to a bunch of sheep wool, the barbs on the individual hairs open and attach to each other. Can I Wet Felt with Cotton or Silk Fiber? Cotton and Silk are plant fibers which are smooth and do not have scales. Therefore plant fibers will not adhere to each other or felt with this process. You can, however, “trap” those plant fibers within wool for added texture or a pop of color. If you’re going to make this a hobby or perhaps a side job, you’ll want to use a Matchstick Blind to roll your piece. Matchstick Blinds give you the option of making larger pieces plus they will last a long time. Just make sure to buy an unstained blind vs. a dyed or stained blind. If you only want to make a few, smaller pieces of felt fabric, Bubble Wrap will be sufficient. It’s a bit more slippery to work with (especially when wet), but it will do the job. You will need a sprinkler of some sort to wet your wool fiber. You need to be able to control how much water is applied at a time. When I first began felt making, I used an old vinegar bottle with holes punched in the cap. This worked just fine for a while but getting the flow of water right can be a bit tricky. For larger pieces, I actually bought an inexpensive Garden Sprayer. These usually hold 1 gallon of water which is great when you are making a large shawl or wallhanging. The nozzle can be adjusted to control the flow of water. A great option for small pieces is a Bottle Cap Sprinkler which fits on water bottles as well as 2 liter soda bottles. There are many different opinions about which soap to use. Honestly, I’ve tried a wide variety of soaps from solid to liquid, expensive and cheap soaps. All of them will work fine but there are some other considerations. Some felters swear by special Olive Oil Soap because it works really well and it keeps your skin from drying out. Plus, if you are using soft water, Olive Oil Soap will be much easier to wash out of your felt fabric. The water at my house is very hard so rinsing is not as much of an issue for me. I usually use clear liquid dish soap and plain Ivory soap bars. Stay away from any colored soaps. They usually have dyes which can discolor your wool. Other than that, the only items you’ll need are a sturdy table, plastic table covers, some old towels and bits of nylon hose for tying your rolled matchstick blind. That about covers the basic supplies. Let’s move on to Needle Felting! With Needle Felting, you use special, barbed needles to tangle the fibers together until they form a matted piece of wool. The needles are repeatedly pushed through layers of wool. This can be done by hand with a single or multiple needles or it can be done by machine. There are a variety of machines available from smaller, hand held models to sewing machine type models. Larger felting machines or looms utilize hundreds or thousands of needles to produce very large pieces of felted fabric. CAUTION: This is NOT a suitable activity for children. These needles are super sharp and can be dangerous. The basic process is the same regardless of the technique used. One or more needles are repeatedly pushed through wool and back out again. Over and over which causes the fibers to mat together. If you’re using a special felting mat or foam underneath your piece, you’ll have to lift your wool off the mat occasionally as the fibers will penetrate the mat. Just as the name implies … this means making a flat piece of felt fabric. You can make a sheet of felt consisting of felted wool fibers alone or you can needle felt on top of another piece of fabric. You can also make shaped felt pieces by using cookie cutters or other molds to shape your felt as you work. And you’re not limited to loose wool. 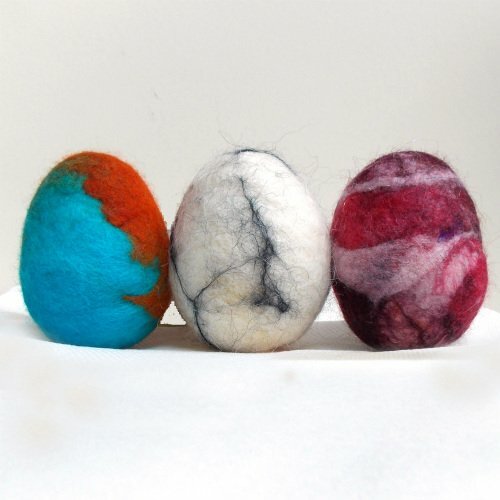 Yarn, roving, silk sliver or other felt can be needle felted onto other pieces as decoration. This technique works great for making scarves, decorating pillow cases, wallhangings or purses. Here’s a very good video showing you the basic steps. 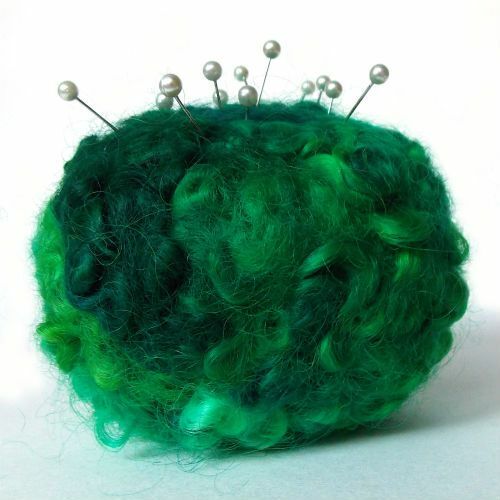 Years ago, I shared a tutorial for making a Needle Felted Pincushion using a Felted Dryer Ball and dyed wool locks. 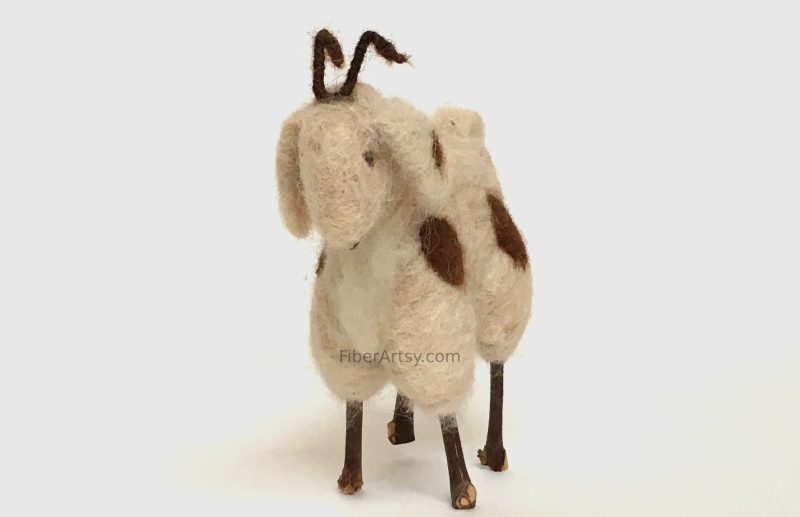 Needle felted soft sculptures seem to be all the rage these days! 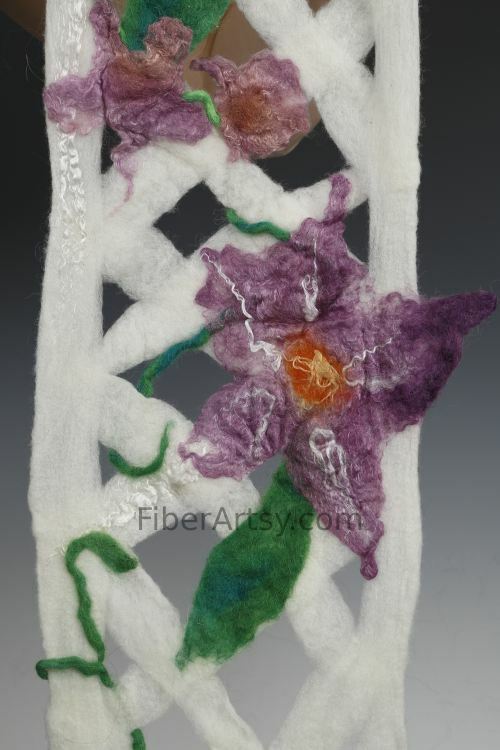 This fiber art form has really become popular among crafters. I see a lot of wool animal sculptures, faces, gnomes, Santas, mushrooms, you name it. Some of these little felted sculptures look almost life like. Personally, I have not attempted to make animals or sculptures but that is definitely on my to do list. I did find a few great basic tutorials. This is a very good article on How to Needle Felt which outlines 3 different techniques. If you’re just learning how to needle felt, you may want to get an all in one needle felting kit. Hint: Make sure that the kit you choose also contains needles. I’ve seen some that only contain wool roving and instructions. Unlike with wet techniques, the wool you use for needle felting does not necessarily have to be a protein aka animal fiber. 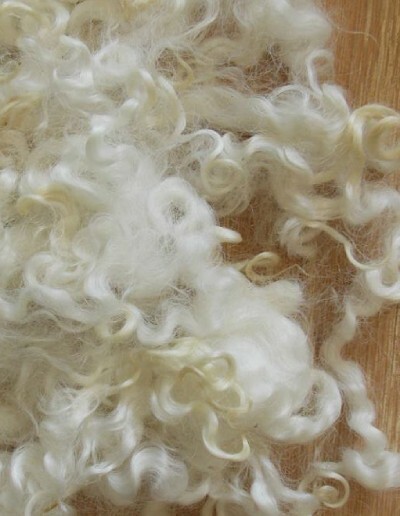 Since you are not relying on the scales of the protein fiber to interlock, synthetic wool can be used. However, animal fiber such as sheep wool may needle felt easier since the fibers are not a slick as a nylon fiber, for instance. Wool comes in many different forms from raw, unwashed wool to processed roving and yarn. Any of these fibers will work just fine. Roving comes in many natural and dyed colors and is easy to work with. Yarn is good for embellishments and decorations but keep in mind that you may need to use heavier gauge needles. If you’re just starting, you may find wool roving more suitable than raw wool fiber. As I explained above, these are special needles which have barbs and notches along the sides to help grab the wool. 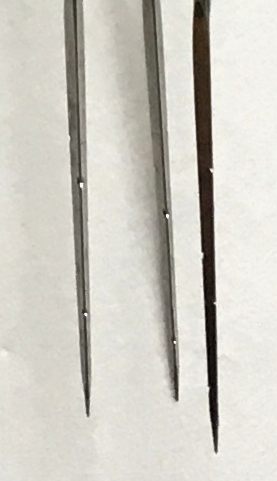 Felting needles come in various sizes or gauges. The larger the gauge number, the finer the needle. Finer needles are useful for smaller projects or more detailed felted sculptures or embellishments. They will not leave holes. Larger needles are good when you need to make a bigger piece or you are using coarser fiber. They will leave holes in your finished felt. For small pieces, you can simply use one needle or a pen style felting tool, which holds 3 needles. For bigger projects, you will want a larger tool which uses 5 or more needles. 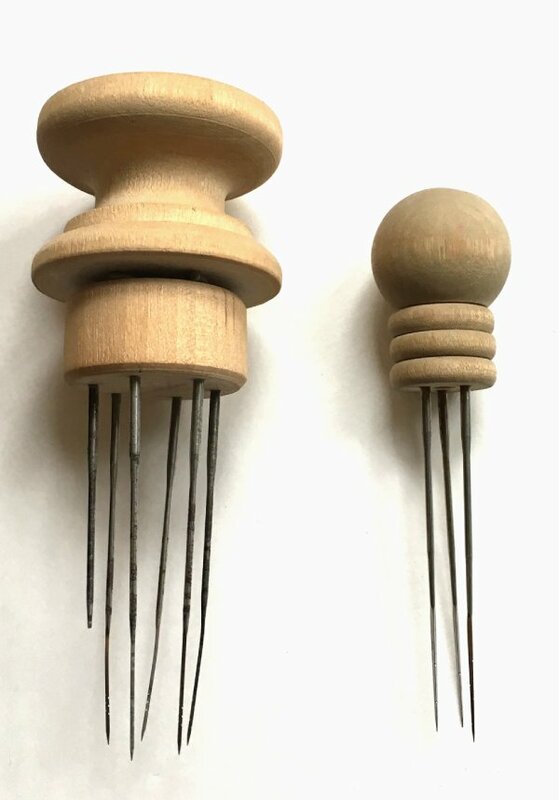 They’re available with fine or heavy tipped needles, so pay attention to your needle gauge. As I mentioned previously, these needles are wicked sharp and therefore I also recommend that you use Finger Protectors. What is Felting Foam? Foam or Mats are the base that you place under your project. As you push the needles through the wool, they will stab into the felting mat. This protects not only you, but also the needles which are somewhat delicate and break easily. If you’re just starting out and want to save money, you can use a large sponge as a underlayment or mat. These are inexpensive and readily available at any big box or auto part store. They are not as durable and won’t last as long as a mat but will work fine. Specialized Felting Mats come in a variety of sizes and materials from woolen to dense foam. Some people prefer to use Mat Brushes. They all serve the same basic purpose. I think the main difference is how much of the wool gets embedded in the mat and how well the mat holds up to the needles. There you have it … everything you need to know to get started with this wonderful craft. I hope you give this fun fiber art a try! Where Can I Find Wool? Fiber and Wool Festivals are usually fun gatherings of many fiber producers and vendors. Wool Festivals give you the advantage of meeting and talking with the farmers or fiber producers to find out about their animals and the wool. You can see and touch a large variety of fibers from angora to alpaca to buffalo and yak wool. Plus, you usually have the option of purchasing an entire fleece or just small amounts. Local Yarn Shops are fun places to browse and usually carry felting supplies. Bonus … it’s always good to support small businesses. Where Can I Learn Other Techniques? YouTube videos and tutorials are great places to learn how to felt but they can’t compare to hands-on learning. Classes or Workshops are definitely the best (and most fun) way to learn. You get one-on-one attention from the instructor plus you meet wonderful people with the same interests. Check the local yarn shops and fiber festivals for workshop schedules.